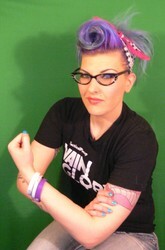 Briana "Tactical Pinup" Falb-Joslin, a native Minnesotan, is a popular video game broadcaster on Twitch.tv. This spunky coffee obsessed avid gamer has been playing video games since she was 3-year-old on the original NES. Under the gamertag, Tactical Pinup, she broadcasts a variety of video games; such as MOBAs, First Person Shooters, RPGS, MMORPGs, etc. From the beginning of her broadcasting career (March 2014), she has dominated the video game world as 'The Pinup Girl of Gaming'. Her drive to create a positive impact on the gaming world has led to raising over $9,000 dollars for Charity over the last year. Various charities she has supported in the past include Extra Life and St. Jude Play Live, as well as being an advocate for female gamers in the gaming industry.